Susan Weiner, president of the Children's Cause, presented at an FDA stakeholder meeting this week on BPCA and PREA: shorthand for the Best Pharmaceuticals for Children Act and the Pediatric Research Equity Act. This meeting served as an opportunity for the FDA to gather information for inclusion in their FDASIA-mandated report to Congress. These two laws - first included in 1997's Food and Drug Administration Modernization Act - are intended to provide requirements and incentives for testing drugs in children. Together, BPCA and PREA create a "carrot and stick" approach that can yield important new safety and dosing information for pharmaceutical products used to treat children. 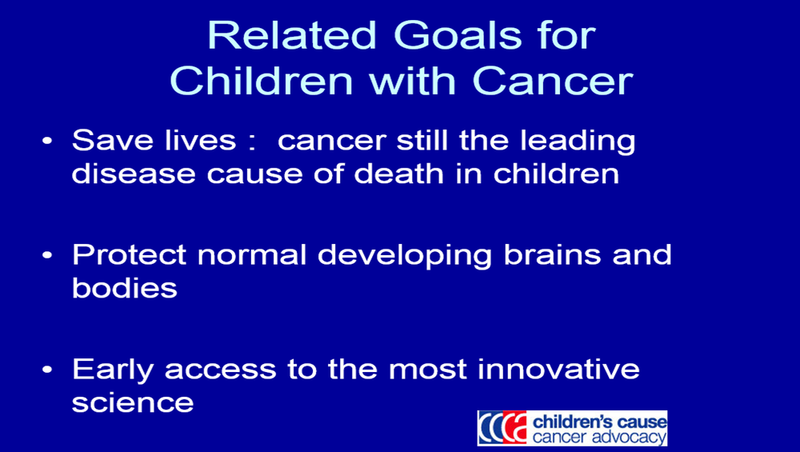 For children with cancer, however, the laws have had only a modest impact. Children's Cause has worked to reauthorize these laws since our inception and we have long been committed to strengthening their ability to advance pediatric oncology drug development. We are also working with the American Academy of Pediatrics and the Alliance for Childhood Cancer to make revisions more favorable for childhood cancer drug development in the reauthorization of the Prescription Drug User Fee Act, which expires in 2017. 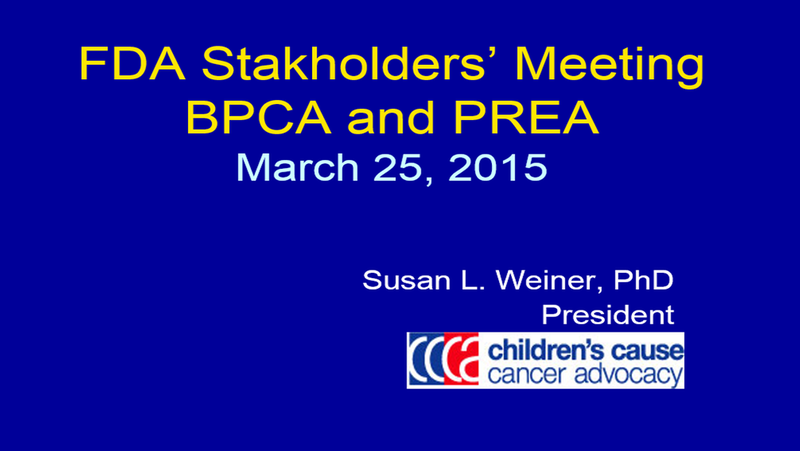 The below slides from Susan's presentation on March 25th outline the limitations of BPCA and PREA and summarize our recommendations for modernizing these laws to better serve children with cancer. Other presentations from the FDA meeting can be found here.